Conference planning is a hefty job. With venue hire, catering, accommodation, guest speakers, promotion and audience targeting; the whole process can be a little overwhelming. With so many large tasks to organise, a simple item such as the conference programme/agenda can end up being overlooked and under-designed. Here we offer budding conference planners a few design tips to help ensure the conference programme has all required and useful information, is suitable for the conference theme, and is aesthetically pleasing. What is the overall theme of the conference? Which colours/design will best compliment this theme? Which design will fall in line with both theme and company branding? If there are event sponsors, is the programme reflecting these brands too? Is the design detracting from the important information on the page? Careful consideration is needed when designing any conference document, you want something that is efficient and serves its primary purpose, but you also want a programme that stands out, reflects your theme and clearly reinforces your brand. What are the key points to be included? How much text is needed? If there is a lot of text, what is the best layout to make it easy-to-read? Do you need to include sponsor names and logos? Will you try to include sponsors subtly across the programme, or have a sponsor list at the end? This can depend on how many sponsors the event has. 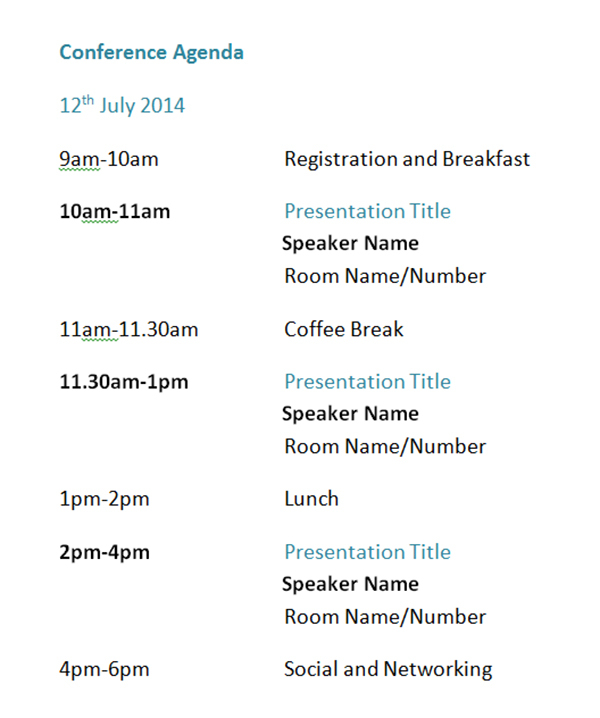 Do you have many guest speakers in each session? Will you have space to include all the speakers? Will you need to include their expertise and job title? If it spans over more than one day, how are you going to distribute each day’s agenda? If it spans over a few pages, are the pages likely to become lost? Will the agenda/programme be sent out as a pdf or printed, or both? Have you budgeted for this? These basic layout questions should be asked before you sit down to design and create your programme, to save you from needing to make time consuming amendments later. There are a few ways to style your programme. A simple table style can clearly present the key information with the date at the top, timings in the left column and the agenda in the right. This is a clear layout, brief and basic but to the point, and ideal for smaller scale conferences or those on a budget - in both time and money! With a well chosen colour scheme and some sponsor banners to break up the text, this format can be a smart or casual (depending on your theme/conference topic) choice for your conference programme. A basic text based style can be elegant and effective, although a little wordier. With the conference title, location and host stated at the top, you can have the date as a title (using an appropriate colour scheme) and simply layout time and agenda sequentially. Well-chosen uses of bolding and quotations can help emphasise key information. If your conference is larger and has multiple talks occurring at the same time, a different style of programme will be required. Another table based agenda/programme can work well here and designs can be jazzed up if appropriate for the conference tone and theme. The table would need to have a few columns for each time slot and each talk/presentation/workshop would need to ensure it has all the essential information (location, title, speaker etc.). A useful extra for this programme/agenda would be to include a basic map/floor plan showing each room location of the presentations/workshops. This can save delegates time and help them find their way to the correct room when there are multiple ‘tracks’. Colour coordinating each ‘track’ would be beneficial and can tie-in quite nicely with branding, as well as theme and design of the overall programme. If you are planning a conference, Jurys Inns Hotels have a range of conference and meetings facilities in our city centre locations. The Jurys Inn Hotel in Milton Keynes is particularly well suited for large conferences, ideally located five minutes from the station and offering a series of conference rooms able to accommodate up to 400 delegates.